More and more medical practices are selecting and implementing electronic health records (EHR) than ever before. In fact, statistics show that the number of practices who have purchased an EHR has doubled in just three years. That being said, many practices fail to prepare for their new EHR and thus do not gain the full benefits that come with implementing a solution. 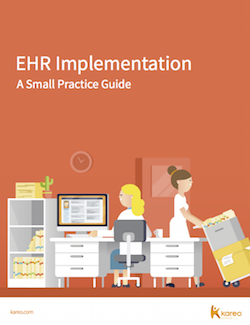 In order to prevent your business from having the same fate with your new system, make sure to download and read our guide EHR Implementation - A Small Practice Guide.